On this date in 1943 over the North German city of Ham­burg, the Royal Air Force kicked off Opera­tion Gomor­rah (July 24 to August 3, 1943). 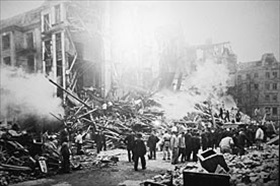 British retali­a­tion for the Luft­waffe’s fire­bombing of the medi­eval city of Coven­try in the Eng­lish Mid­lands, where 500 tons of ex­plo­sives and 56 tons of in­cen­di­aries over a 10‑hour period killed 538 Britons and de­stroyed the his­toric cathe­dral, had been two and a half years in the making. The Ham­burg bombing tactics were nothing new: first high-explo­sive bombs dropped over the tar­get to blow off roofs and open doors and win­dows, then incen­di­aries to ignite the splintered remains. 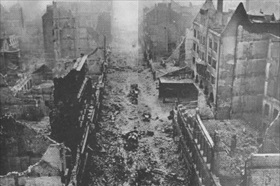 The dif­fer­ence lay in the scale of the city-busting offen­sive against “the second city of the Reich.” On the night of July 24–25, 1943, 791 RAF bomber crews dropped 2,300 tons of bombs on Ham­burg in little over an hour—five times more ton­nage than the hea­viest air raid the Luft­waffe had in­flicted on the British capi­tal, Lon­don. The fires lit by the incen­di­ary bombs were fan­ned by winds, causing single blazes to merge into an in­ferno. The raid was repeated three days later with even more devas­ta­ting effects: this time the “fire typhoon,” as con­tem­po­raries called the merged fires, caused a giant up­draft that sucked in air to create a fur­nace that immo­lated 42,000 souls, set as­phalt streets on fire, incin­er­ated the city cen­ter, and destroyed 16,000 apart­ments; nearly one million people were left home­less. Winter coal supplies stored in cellars burned for weeks. The Britain-based U.S. Eighth Air Force joined in the destruct-a-thon, con­duct­ing 235 day­light sorties in two raids on July 25 and 26. The devas­ta­tion wrought by nearly a million-and-a-half incen­di­aries on U‑boat pens, fac­tories, busi­nesses, and resi­dences so jolted Adolf Hitler that he refused to tour the city after­wards. But Ham­burg’s intro­duc­tion to hell fore­shadowed what Ber­lin would soon look like, albeit with­out the fiery fur­nace. Between the end of Gomor­rah and March 1944, the RAF moved the war to Hitler’s door­step, dis­patching more than 10,000 sorties to drop over 30,000 tons of bombs on the Reich capital. 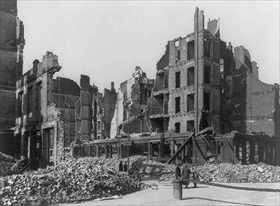 It was the RAF’s supreme effort to destroy Berlin and end the war. Although aerial bombing destroyed places of pro­duction and workers’ homes, killed inno­cents, affected morale, and reduced the Ger­man war effort, it didn’t end the con­flict. Boots on the ground did that. Left: Fires smoldered, possibly in cellars storing coal, for weeks. Ham­burg’s unprec­e­dented de­struction dem­on­strated that the Allies would win the war in Europe, and that Germany would pay dearly for every day it did not capit­u­late. As Brit­ish Prime Minis­ter Winston Chur­chill said, after the Ger­man and Ital­ian forces began retreating from North Africa in Novem­ber 1942, it was the “end of the beginning.” Ham­burg in July 1943 was the beginning of the end. Right: The destruction of 6,200 heavily urban­ized acres (nearly 10 sq. miles) of Ham­burg was grim. 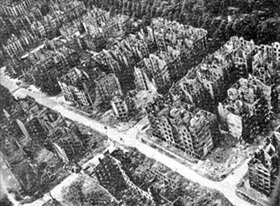 Only Berlin, with 6,427 burned-out acres, had more total area leveled, according to RAF calcu­la­tions. Altogether 277,330 Ham­burg apart­ments, 580 indus­trial plants, 2,632 com­mer­cial con­cerns, 80 Wehr­macht instal­la­tions, 24 hos­pi­tals, 277 schools, and 58 churches were de­stroyed in Operation Gomorrah. Left: Hamburg’s air raid shelters and bunkers were in­suf­ficient and simply in­ca­pa­ble of pro­tecting its popu­la­tion from the effects of the Allied air cam­paign. All resi­dents not engaged in the arma­ments in­dus­try were eva­cu­ated. Roughly 900,000 citi­zens left, thou­sands ending up in refu­gee settle­ments in Schleswig-Hol­stein (107,000), the Bay­reuth dis­trict (58,000), Magde­burg-Anhalt (55,000), Han­nover East (45,000) and Dan­zig, West Prussia (now Poland) (20,400). 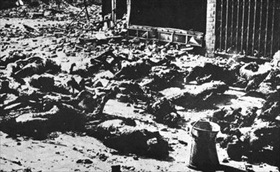 Right: Scene confronting rescue workers entering an air raid shelter after an air raid, possibly the July 27–28 raid. Of the esti­mated 30,000 victims of that apoc­a­lyp­tic raid, most suc­cumbed to car­bon mon­ox­ide poi­soning when all the air was sucked out of their shel­ters. 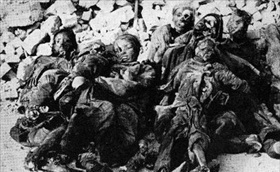 By the end of Novem­ber 1943, autho­ri­ties had recovered 31,647 bodies, of which only 15,802 could be identified.